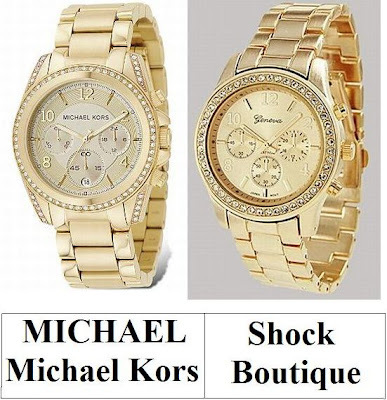 Mes chers, to your left you will find MICHAEL Michael Kors’ stunning Stainless Steel Chronograph Watch; to the right take a peek at Shock Boutique’s glamorous Gold Boyfriend Watch. While the show-stopping Shock Boutique piece lacks the true crystal stones of the classy Kors offering, instead proffering a ring of rhinestone detailing upon the face; for a mere $30.00, as opposed to the $250.00 required to take the real deal home, it allows the fabulous fashionista that is vous to show off a little high fashion bling – on a blissful budget! Tell me, kittens…will you be a big spender and go for MICHAEL Michael Kors, or be thrifty and spring for Shock Boutique? Shock Boutique all the way! I still won't be able to afford it LOL, wish I have the money. My favorite is the Michael Michael Kors watch. I'll go cheaply. I bet I'll be the only one! I think I prefer the cheaper one!! Ooh, that watch is gorgeous. I would have to get the Shock Boutique watch, though, because I would have to have my eye on the Michael Kors watch if I spent that much money on it. Have a good day, E.
i always love a steal ...but i love my michael kors watch far too much! Love MK!!! I am in need of a watch badly, so this def help! I hate to say it, but no one can beat Michael on watches these days. The man is brilliant. $30? Did I read that right? Oh my goodness I am in love! I love bold things like this. So eye catching! The Michael Kors for sure!! I'm wearing mine now! Best gift ever! They are both lovely! But I just have such a love of MK watches. You can find them brand new on ebay for about $150 though! Thank goodness for Shock Boutique again. As it is ..none of my old beaus are Prince Will..so this would be just as good. Cheap, though I love Michael! Watches are timeless (haha) therefore I would have to splurge on the Michael Kors or better yet ask Santa to leave it in my stocking! My hubby bought me a Fossil Boyfriend watch a couple years ago and I have forsaken all my others to wear the Fossil watch every day!! Tons of compliments on the boyfriend watch!! I love the lighter color of the Michael Kors. I'm not going to lie, the MK looks so awesome. That watch would look great, and never go out of style. you are so talented at these finds!! Oh wow, these are very similar! I like both, but the MK is glamourous in a more subtle fashion, while the Shock Boutique is more flashy compared. Love that cheapy weepy one. I'd budget this one for sure. Wow they are like identical. I will def. be going for the $30 ones! OMG you read my mind! i've been obsessing over the michael kors watch & trying to find a less expensive alternative. i'm definitely checking out the shock boutique style! Although the Shock Boutique watch is nice, I prefer the subtle elegance of the Michael Kors watch. I can't describe it, but there's something about the lighter color of the hands on the watch that draws me to it. I wonder about Michael Khors quality sometimes, recently saw some of his things in Marshall's or TJ Maxx. Great post, though I have no use for a watch! Definitley a gorgeous blingy watch. I love boyfriend style watches! The Michael Kors one is amazing. oh yeah! I'd for the shock boutique. I go through watches fast, unfortunately. So pretty, and so glad the cheaper one is available. any chunky gold watch is great - love them both! My coworker has the MK watch and I've always loved it. Seriously looks great in person, but your steal/deal is way worthy of being a great alternative. Loves it!